How do you get established teams of experienced people fired up for emerging challenges, unleashing news ideas and working even better together? Well, if you’re happy to try something a little bit ‘out there’ an ‘unconference’ could be all you need. Because they’re fairly free-form, unconferences are designed to be self-determining: issues which participants want to discuss will naturally bubble up. This makes them a useful engagement tool, because it’s very clear that the subject matter has not been designed “top down”, and there is an opportunity for attendees to shape the content. They can also be cutting edge, solving problems or spotting opportunities in an agile and proactive way. Traditional company conferences and off-site days take weeks if not months to organize, whereas an unconference can pick up those ‘hot topics’ that are live for attendees at the time. And by removing protocols, unconferences can give more people more opportunity to contribute. The most persuasive argument for the expense of offsite events is that it gives attendees a non-standard environment in which to think beyond their role, job description or usual hierarchy. The unconference takes this to its logical conclusion; putting people in a different situation and giving them plenty of intellectual stimulation and food for thought. I recently ran an unconference in a very traditional transport business, where hierarchies might be expected to stand in the way of open conversation. Indeed, the goal of the session was to give participants a route to open communication for the rapid and effective escalation of challenges. 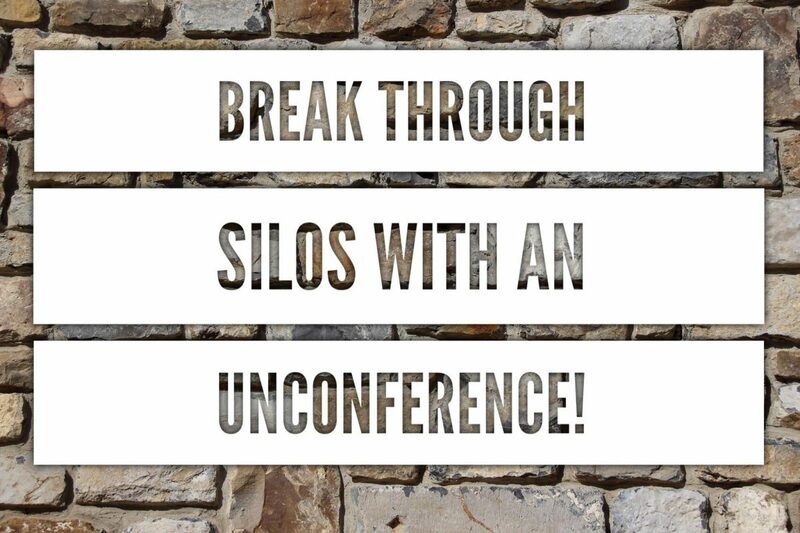 By the time we reached our first break, barriers had been broken, silos smashed, and we couldn’t get participants to stop talking to go for coffee! When a Senior Director came back to check on progress and offer his final thoughts, there was still a rich seam of conversation and a buzzing atmosphere. Equally, though, some people prefer a rigid structure. After all, structure means you can prepare, think of ideas to bring to the table, work out who you want to chat with and decide what outcomes you want to achieve. Why on earth would you turn up to a business event unprepared?! And why would you offer your team to decide what you (as a manager) want to spend time on? So not everyone is a fan. An unconference is like most engagement tools: a double-edged sword, with execution as the fulcrum. Executed well, you will unlock collaboration, no matter what the age, experience or role of your participants. Executed badly, you will make people feel inadequate and put upon; forced to participate when they have nothing to contribute, or made to exceed the comfort zone of their job description. The skill is to maximise the benefits of looseness – a relaxed environment in which rapid ideation is possible – without losing the inherent strength and value in having at least some structure. Like a theatre show, a good unconference is fun, elegant and seamless, but there’s been lots of strategy and hard work underneath. Here’s how to do it. The Dinner Party Rule. The rules of good engagement for an unconference are not much different to running a good dinner party: make people feel welcome, valued and listened to, and they will settle in just fine. Go somewhere new. If you can, don’t hold your unconference in the staff canteen. As we mentioned above, being out of the office doesn’t just give a sense of excitement, it flattens hierarchies and allows people to communicate as equals. Plan a framework. An unconference shouldn’t be a shambles. In my most recent session, we identified five key topics form earlier team activites to make sure they were issues the team themselves knew they were facing, and identified a lead for each to allow them time to prepare. The structure remained loose, but that’s not the same as putting people into a blind panic with an event that’s a total surprise. Give people choices. Choice is at the heart of unconferencing. It’s a fallacy that unguided people will make the wrong decisions or lazily sit back and do nothing. By allowing attendees to decide in what ways they intend to participate, you are allowing them to maximise the value they can add. Most people are highly professional and like to help and to be useful; with appropriate freedoms you can optimise the value of that latent talent and goodwill. Commit to outcomes. The worst possible result is for that goodwill to be hijacked by “the system”. Make a commitment that all ideas will be examined, and that reporting back will happen by a certain date. This will maintain momentum and allow good ideas to push forward. Comments and feedback. Back in the office, give everyone a chance to offer feedback or to comment back their refined thinking. Sometimes this is a desire to communicate privately (still sometimes a feature of many offices), sometimes it is simply a desire to give ideas the thinking time they deserve. Either way, keep the door open. My transport client is planning to do more unconferences and we have already used the format again for an event with supplier representatives. Get in touch to find out if an ‘unconference’ could help you.